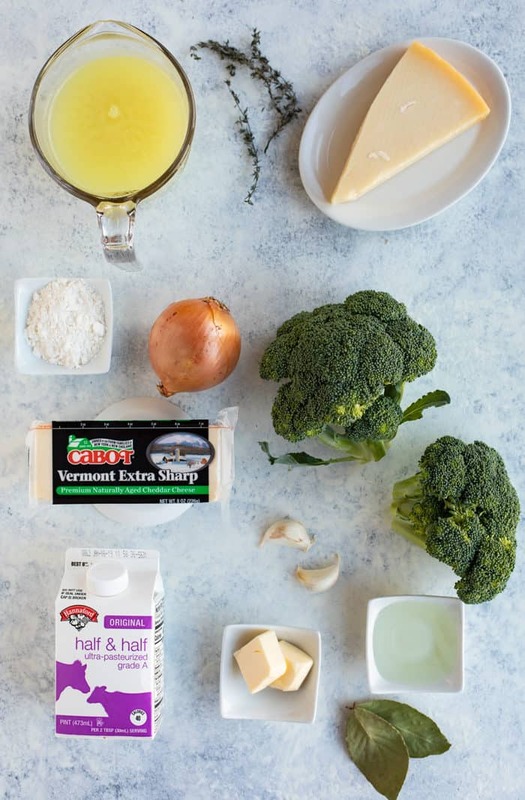 This roasted broccoli and white cheddar soup is loaded with creamy white cheddar cheese that’s enriched with the flavors of perfectly roasted broccoli and melted Parmesan. I think we can all agree that broccoli cheddar soup is the best thing to happen to the planet. But, the flavor that you get from roasting that broccoli and mixing it up with white cheddar cheese is pure heaven. Broccoli roasted at 400 degrees takes about 15-20 minutes. It tastes great with some grated Parmesan sprinkled on at the end! This is the olive oil that I like to use for roasting. If you want to add an additional layer of flavor to this soup, you can add 3/4 cup of white wine while you add the onions. It takes this soup to a more an even higher level of sophistication. You can absolutely use regular cheddar cheese in place of the white cheddar if that’s what you have on hand or prefer! Leftovers should be stored in the refrigerator and used within three days. You can also freeze this soup, it’s best if used within three months. The texture isn’t quite the same when reheated, but it’s definitely still enjoyable. 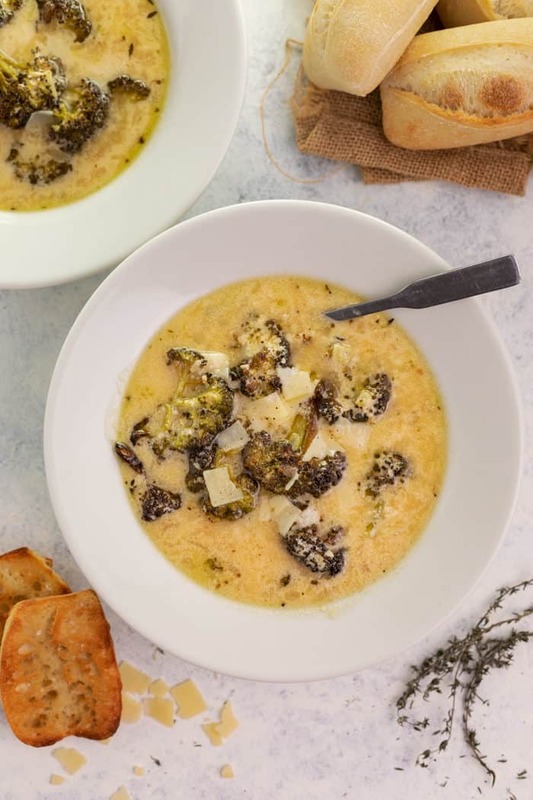 This roasted broccoli and white cheddar soup is loaded with creamy white cheddar cheese that's enriched with the flavors of perfectly roasted broccoli and melted Parmesan. Grate the white cheddar and let it come to room temperature. This is needed to ensure that the soup is smooth and creamy. 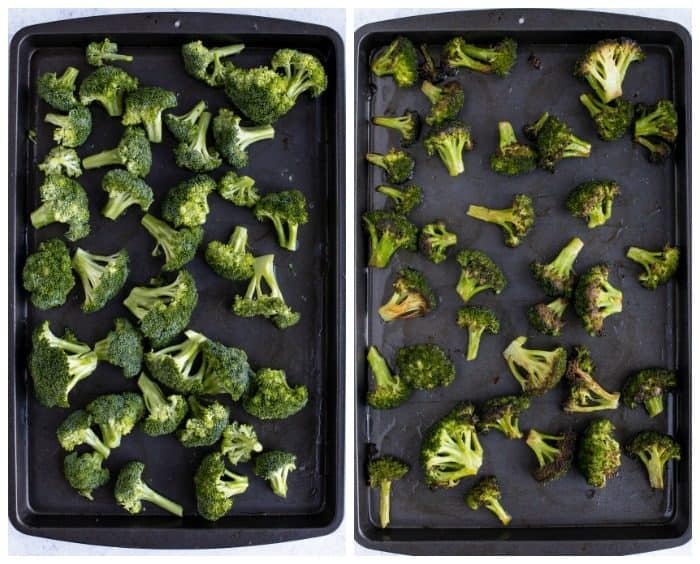 Add the broccoli to a baking sheet and drizzle the olive oil and desired amounts of salt and pepper. Sprinkle the Parmesan cheese on top of the broccoli and heat until the cheese is just melted, about 3-5 minutes. Remove from the oven and set aside. Melt the butter in a large soup pot, over medium heat. Add the onions and cook, covered, for 7 minutes. Remove the cover, decrease heat to medium low, add the minced garlic, thyme, and bay leaves and cook for an additional minute. Sprinkle in 1/4 cup of the flour and whisk with a fork, heating just long enough to rid the raw flour taste, about 2 minutes. Gradually add the chicken broth and bring it to a boil, then decrease the heat back down to medium low. Heat the half and half in the microwave until just warmed or no longer cool (about 30 seconds or so), then add it to the soup mixture. 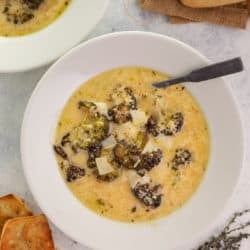 If you prefer to slice your roasted broccoli into smaller bites, do so, and then add to the soup. Turn the heat off and transfer the pot to a cool burner. Sprinkle the cheese with a Tablespoon of flour. Gradually add the cheese to the soup, stirring as you do so. Serve once well-combined! 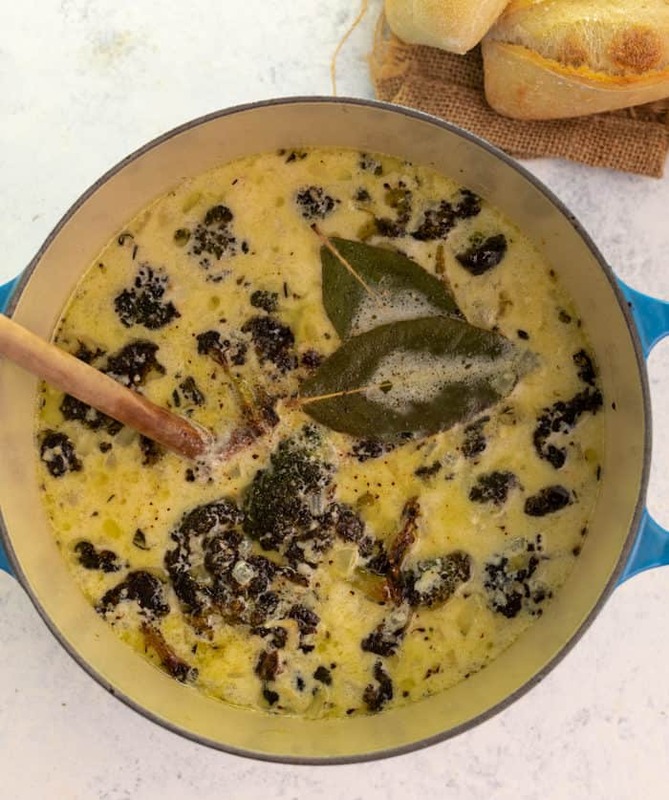 This soup looks delicious and so perfect and comforting for these cold winter days! I love the idea of roasting the broccoli. Thanks for sharing the recipe, Stephanie! Enjoy the rest of your vacation! Hi Stephanie! Does this soup reheat well or is it better fresh? Haha! I’ll give it a try and see how it goes. I want to make a batch for work lunches. Thanks to you and your husband!